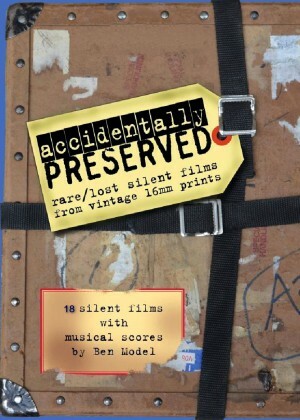 "Accidentally Preserved: Rare and Lost Silent Films from Vintage 16mm Prints" is a collection of 18 short films made from 1919-1929, presented in new HD transfers with new musical scores on piano or theatre organ by Ben Model. The films are all new to DVD, and 5 of them have not been seen by anyone in several decades. During the 1930s and 1940s companies like the Kodascope and Universal Show-At-Home libraries made 16mm copies of silent movies for people to rent and watch at home. It was like Netflix for the art deco era. Because these movies were on 16mm safety film, many of them have outlived the original 35mm nitrate prints of silent films that are now lost or extremely rare. It's as if these movies were...Accidentally Preserved. Renowned silent film accompanist/historian Ben Model has taken 17 of the rare and lost silent films in his 16mm collection – plus one from the collection of film archivist Dino Everett – and produced this Accidentally Preserved DVD, bringing these rarities to a new audience in new HD digital transfers. Each film on this DVD has a new musical score by Ben Model performed on piano or theatre organ. Unavailable to the public for decades, these delightful comedy shorts -- as well as the lost, unknown Elgin Watch factory film -- return to screens to entertain us once more.